Given that surfaces which capture attention are more likely to be perceived as figures (or figures attract attention more than ground does? ), is there a bias associated with the luminance of a surface? For example, we often see dark figures (e.g., text) on white paper. Do you know of any literature to suggest a bias where darker surfaces are shown to attract attention more effectively than lighter surfaces (or vice versa)? Or, alternatively, is there data available on a possible bias where figure-ground segmentation is more likely to occur for a dark figure on a white ground (or vice versa)? From my personal experience, I do not think darker surfaces are regarded preferably as the object, and light surfaces as the background. I have been pondering on this question for so long that I decided to post an answer. Perhaps it will draw attention from others who can give a more definitive answer. 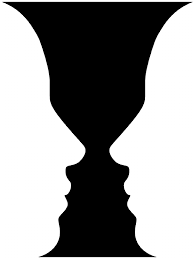 This answer was inspired by this question on the Rubin Vase Illusion. It is an ambiguous figure/ground illusion which is thought to depend on the visual system analyzing scenes in terms of object (figure) and background (ground). You can see a vase when you regard the faces as background and vice versa. In the Fig. 1 below I have posted two versions of this illusion where the black and white portions are reversed. 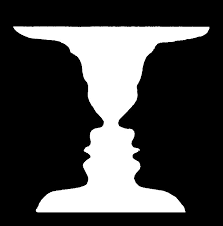 Personally, and hence anecdotally, I do not perceive a clear difference in the perception of the vase versus faces between both figures. Hence, based on this anecdotal evidence I tend to believe that the definition of figure and ground is independent on color (shades of gray in this case). I couldn't find references for the flip-flop rates or vase-versus-face perception time on the two stimuli, unfortunately. In all, what a great question! In psychophysics, why are log luminance rather than absolute luminance values reported? Is there any evidence that environmental enrichment enchances executive functioning in humans?